﻿ Amos 3:3 Do two men walk together unless they have made an appointment? Can two walk together without agreeing to meet? 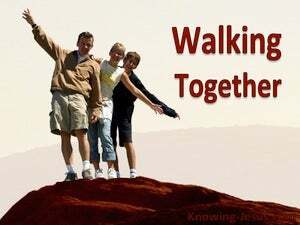 Is it possible for two to go walking together, if not by agreement? Shall two go together if they met not by appointment? Do two walk together unless they have met? 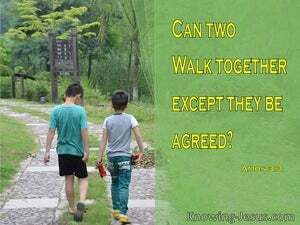 May twain walk together except they be agreed among themselves? 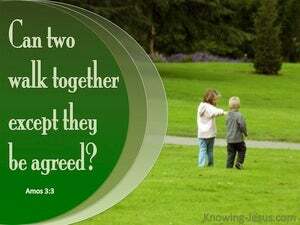 Do two walk together, unless they have agreed? Can two walk together, - except they meet? 2 "You only have I chosen among all the families of the earth; Therefore I will punish you for all your iniquities." 3 Do two men walk together unless they have made an appointment? 4 Does a lion roar in the forest when he has no prey? Does a young lion growl from his den unless he has captured something?